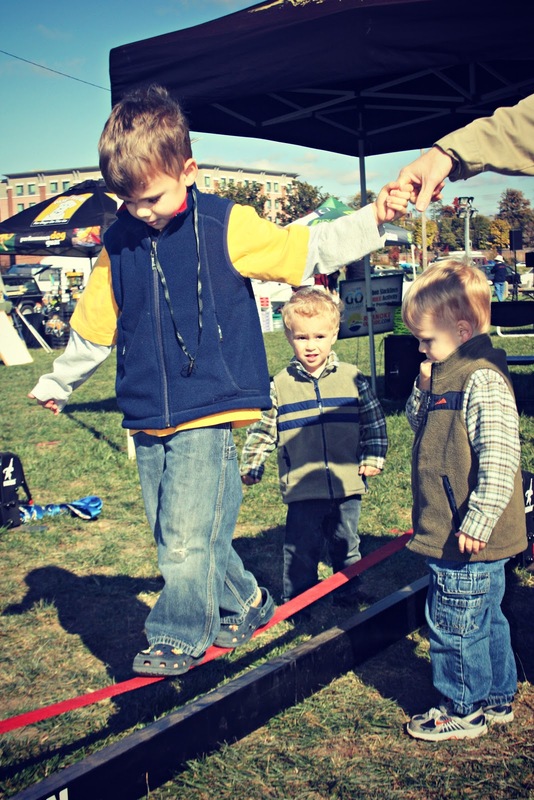 Roanoke Go Outside Festival is a new name for the outdoor festival that we went to last year, and we returned again because it's great (free!) fun for the boys. My favorite thing was the pool jumping dogs. I think our border collie would've enjoyed this. He likes water. We watched the pool jumping dogs for quite a while. Next time we'll have to take Scooter, so he can have a chance. GoFest is very dog-friendly. The boys did the slacklines again this year. It's still pretty tricky for them to stay up for more than 1 second without holding someone's hand. Pierce made a first aid kit. Then the rest of the day he asked if anyone was bleeding or hurt. He really wanted the opportunity to bandage us up. 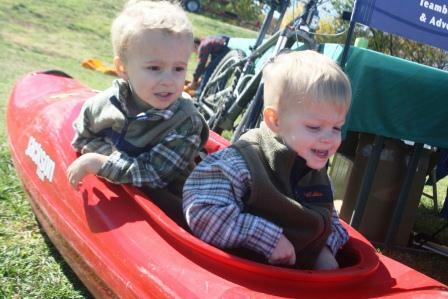 The boys went downriver....in their minds, anyhow. Perhaps one day they'll go downriver on water. These are sumo wrestling tubes. 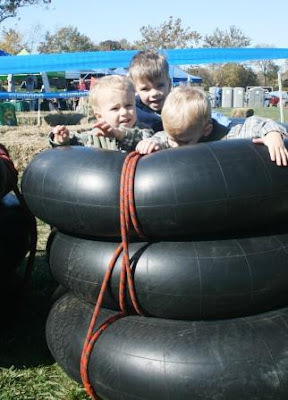 Like a redneck version of sumo wrestling - you each wear these tubes and then tackle each other. As much as Paul and I wanted to sumo tube wrestle each other, the line was sadly too long. Pierce rode the bull. 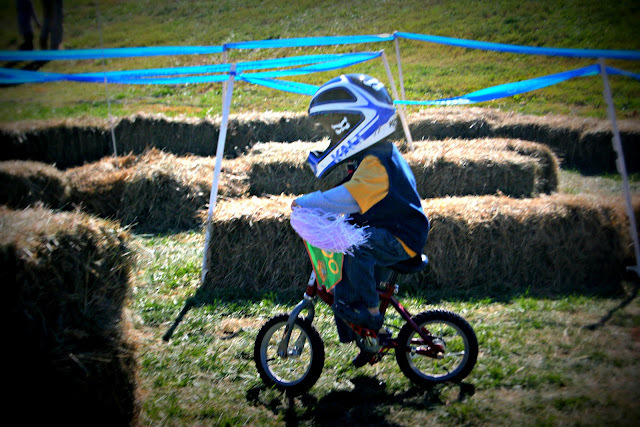 He did great - he hung on for quite a long while! He was nervous about trying it, but I think he had fun. Well, you know if big brother does it, littlest brother has to give bull riding a shot too. And you know if littlest brother rides a bull, you can be sure that the middle brother is going to get up there too. 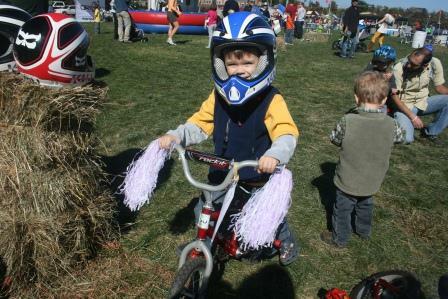 After that, Pierce rode through the bike maze. He was a little top heavy. When you're a little top heavy, it makes negotiating corners kind of tricky. But he sure had a good time. As we all did! Oh I indeed had a great time. Thank you bringing me along. I love the flying dogs and those smiling faces full of adventures that will last forever in their minds. Awesome pics and great moments. 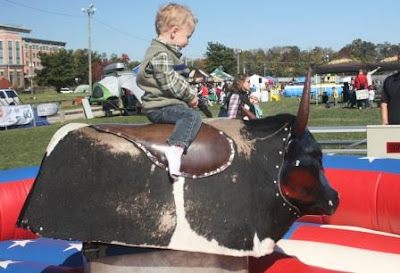 Flying dogs and bull riding, they'll remember this forever! What fun for the boys. I have never seen anything like this in our town. They look like they had such a good time! 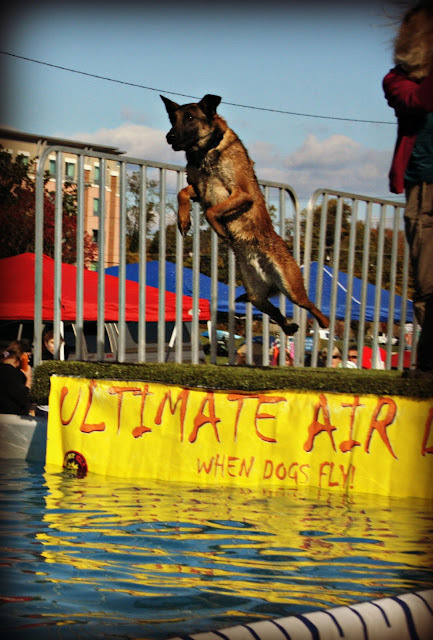 Look at those dogs jumping-awesome! They sure have lots of activities to keep the kids busy. Love the Bull. This festival looks like so much fun! There was so much to do! Love the pretend 'going down river'. HA HA what fun for the boys. I am very impressed with the activities available. They don't have anything like that around Lynchburg that I know of. Love the pics! What a fun time, looks like a fun one to look forward to. How fun!! 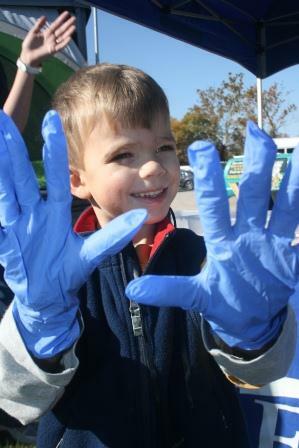 Looks like there was tons of hands-on stuff to do for the kids--which is always a hit. Bummer about the sumo-wrestling--I would have loved that too! sounds like a lot of fun stuff for young boys. 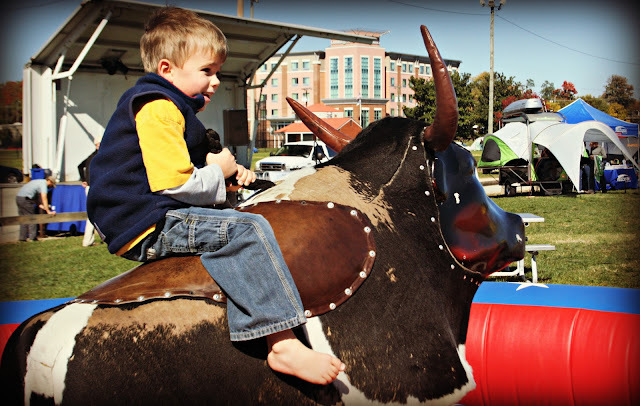 Great photos... Love the look on Pierce's face when riding the bull. So sweet! How funny that Pierce was hoping for a bleeder. lol Maybe he'll be a doctor or paramedic one day. How wonderful to have such a fun event for families and for free too! Looks like everyone had a fabulous time. These are the cutest photos, Lisa. What a fun event for the boys. Hope you all enjoy the weekend. Oh my gosh, those pool jumping photos are hilarious! Never seen dogs in pool jumping before but I want to now! Looks like you all had a great time. Your little guys are so dang cute! I bet they did have a blast there. I love home town gathering things like that! Super. Fun times with the kiddos! Wow, they really had a ton of fun activities for people to do. The kids clearly loved it! I think I would have enjoyed those dogs as well, not so much the bull riding! Oh my it looks like some awesome fun for boys. I would have loved to try the bull ride. I hope you have a great weekend. I would have liked to see those jumping dogs! Glad to see the boys had so much fun. I like to watch those water jumping dogs too. Looks like the boys had a great day. Looks like a lot of fun. 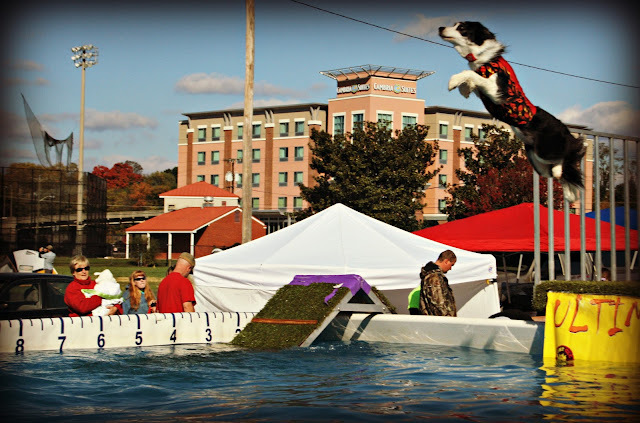 Those pool-jumping dogs are CRAZY! wow, looks and sounds like a lot of fun! 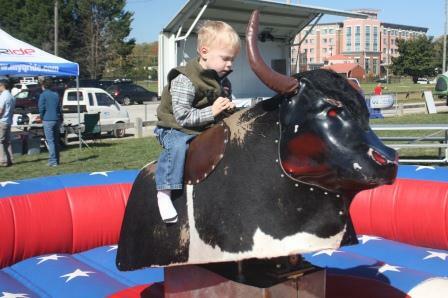 what a great event for kids...flying dogs and bull riding the kids clearly loved it! I am just amazed at how the twins are growing! They must be easier to take places like this now. Looks like such a fun day! Looks like the boys had a great time and I love the dogs! That had to be fun to watch. That just sound like an AMAZING Amount of FUN! 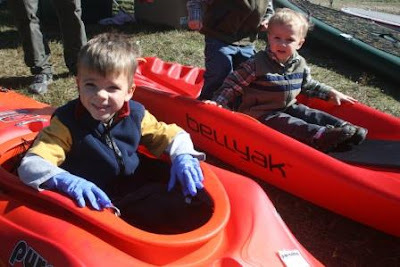 This event looks like it is perfect for little boys! Free??? That looks like a lot of fun! What a fun festival - those dogs are awesome!